“Ours was a chaotic house, without rules, schedules, and one that didn’t feature a consistent or neatly stocked pantry or fridge,” Marcy Goldman explains in her upcoming book The Newish Jewish Cookbook. “Food at home was all over the map.” Some of it came from her bohemian mother and her travels, but many dishes came from the housekeepers and caretakers who looked after her grandmother Iliena, who lost most of her sight in her 20s. When Marcy was 7-years-old, Iliena, who Marcy called bubby (“I thought that was her actual name,” she says), came to live with them and the two shared a room until Marcy was 11. “She was a lovely, gracious, beautiful person and we were extremely close,” Marcy adds. Iliena had fled to Canada without her family to escape the Cossacks when she was 20. 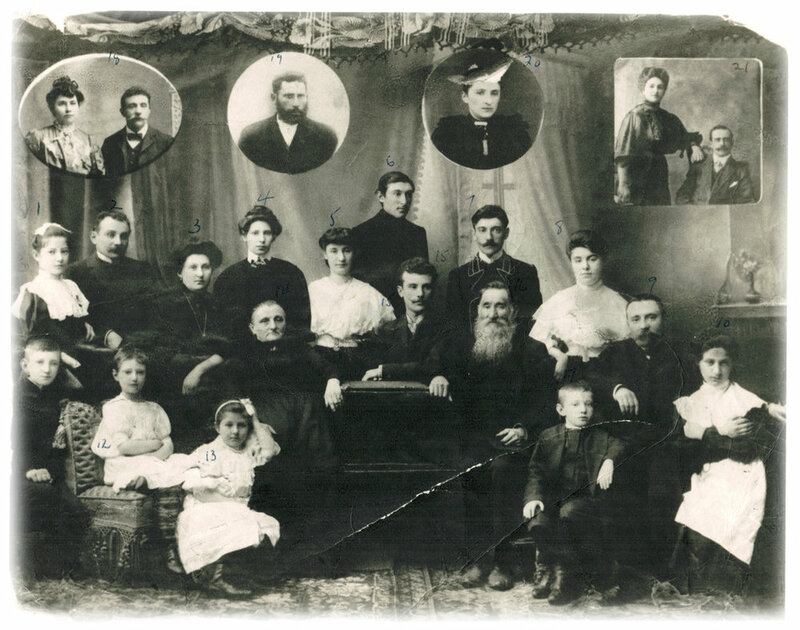 Marcy’s grandmother, Iliena is in the small upper right inset photo, with her grandfather, Moiscia (Moses) whom she never met but is named after. Their home wasn’t a religious one, but Iliena would “ask me to light my shabbat candles…. [she] must have had some sight left, so she would ask me to turn her to the light.” That’s how Marcy learned the blessing over the candles. That’s where the shabbat celebration, however, would end. Shabbat recipes weren’t part of the Friday custom. For Marcy, who has authored several Jewish cookbooks, that came later in life — and from an unexpected source. When Marcy was a teenager, a Caribbean woman named Gloria came to care for Iliena and cook for the family. One of Gloria’s specialities was a chicken showered with spices like paprika, poultry seasoning, celery seed powder, and cumin, plus 12 garlic cloves and lemon, as well as fresh rosemary and parsley. “Almost every spice in the pantry,” Marcy says. It was also one of the dishes she made early in her married days, as she became more observant. And, then later, as a single parent Marcy “kept Friday night with my sons [and] that was our chicken,” she adds. Neither she nor her sons realized it was unusual until they spent Shabbat at the home of friends, where the chicken wasn’t showered with spices. 2. Place the chicken in a roasting pan. Rub with olive oil, squeeze the lemons over it and stuff the lemon remnants into the cavity along with the onion. 3. Add the water, wine, parsley, rosemary and garlic to the pan, scattering them around the chicken. Completely coat the chicken with all of the remaining spices except the salt. You should not be able to see any skin as the chicken should be totally coated in spices. Sprinkle on the salt. 4. Roast the chicken, occasionally basting with the pan juices. Cover any exposed skin with the spices (paprika & garlic powder) that may come off as you baste. For the final third of cooking time, lower the oven to 350°F and let the chicken roast without basting. Roast until the juices run clear or a thermometer reads 165°F when inserted into the thickest part of the thigh. A 3-4 lb. chicken should take between 45-60 minutes to roast. 5. Mash the garlic into the roasting pan juices and use pan juices as gravy. Quarter lemons vertically from top to within 1/2 inch of bottoms (do not cut all the way through). Sprinkle salt (1/4 to 1/2 teaspoon) on exposed fruit and close lemon. Place 1 tablespoon of salt on the bottom of a large Mason jar. Pack in the lemons, pushing down to release more juice. Add a few teaspoons of salt at each layer, along with some peppercorns (and chilli pepper). Cover with lemon juice and seal. Let stand in a warm area for at least 30 days, turning jar upside down each day to distribute salt and juices. If a cloudy growth appears, remove it with a wooden spoon. These keep 1-2 months refrigerated.